Not lonely, but alone. - BREVILOQUENT. "You just need someone to cuddle you to sleep" He said at 4am..
Daphne almost laughed and cried together and wondered how was that even possible. She had woken up in the mid of every single night from the past two years now, either to crumbs of memory or even to a sleep that turned into poetry. 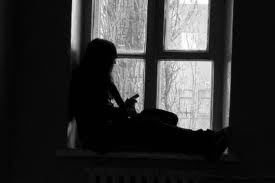 Nights had caused her a lot of loss, yet she fiddled and sat with her muse in that one window that hadn't abandoned her unparked baggage yet. She still didn't know what she wanted, but was sure of what she didn't. She surely wasn't looking for another night where she'd cuddle up to him and sleep. Neither did she want him to stay for her on the phone till she would slip into ecstasy and sleep like a dream. She wasn't game to stay up with him till he was tired enough to let her be. She wasn't looking for him to keep writing to her words, that did not breathe. Yet she woke up every night, trying to look for what she wanted. It had been a long time now that she hadn't met sleep, gazing at the fairy lights she knew sleep would be a lovely companion. Nights when her words wore no voice, or maybe they slept when she wished for them to scream. Nights when her dried heart no more tempted, yet she sensed the strangeness that none did. Nights when she'd sit on that window sipping coffee alone, beading together the days that she'll share it with him. She wasn't looking for those days, neither looking forward to see him again. Yet she wanted to hurt him with the things she had to say. She knew what she never wanted. But woke up to jostle through what she did. There was a pair of silence in the bedroom now, she'd woken up yet again. Nothing would matter in few hours when she'll wake up again and the previous night would close up to yet another day. Damn, that is so nice. Found it out through your About. me Page. Absolutely brilliant. I love how you've put it into words. Unfortunately I've been or rather going through a very similar experience. Sleep eludes me. I want to hold on and yet the most logical thing is to let go. I want to forget but the nights haunt me. I'd do anything to forget it all just for a day. I'd do anything to have the control that I had over my being which is now lost. I don't want her back and yet I have so much to say to her. I wish I could utter it all out but I can't. They say it gets better but I don't see the light.